Imagine being able to paddle from Plaster Creek to the shores of Grand Haven. Water trails are making that possible. A water trail is a designated route on a waterway with a network of public access points and signage. Similar to a hiking trail, water trails help encourage recreation and conservation by directly connecting people with the water system. On a cool, breezy summer morning in West Michigan, two recent graduates from Calvin College strapped an aluminum canoe to the top of their car and drove down to the Grand River. Gabe LePage and Peter Sunshine Cahill just received their Bachelor of Arts in Geography and were looking for a post-graduation adventure. Their mission? A paddle of the entire lower Grand River, from downtown Grand Rapids to the shores of Grand Haven, in one day. Using atlases to navigate over forty miles of the river, they set off where Plaster Creek joins with the Grand, just west of where Interstate 196 crosses over the river. With some food, a first aid kit, and plenty of water, they canoed the river to see what it had to offer. In part, LePage and Cahill attribute the inspiration for the trip to their geography courses at Calvin, which emphasized developing a sense of place by intimately knowing an area’s history, culture and natural features. Their courses had also taught them to look for and notice connections within the landscape—specifically, connections between people and the natural world. LePage and Cahill also noted a desire to get up close and personal with their watershed—or the common point where water drains when it falls within a given area. The Grand River, the longest river in Michigan, serves as the central vein of the Grand River Watershed. An impressive 19 counties drain into the 5,572 square mile Grand River Watershed, and 108 species of fish and 218 species of birds call the watershed home. Avid birdwatchers themselves, Lepage and Cahill kept a long list of birds they saw, including various types of gulls, herons, and songbirds. “Watersheds are a great way to organize the geography of the world,” said Cahill. 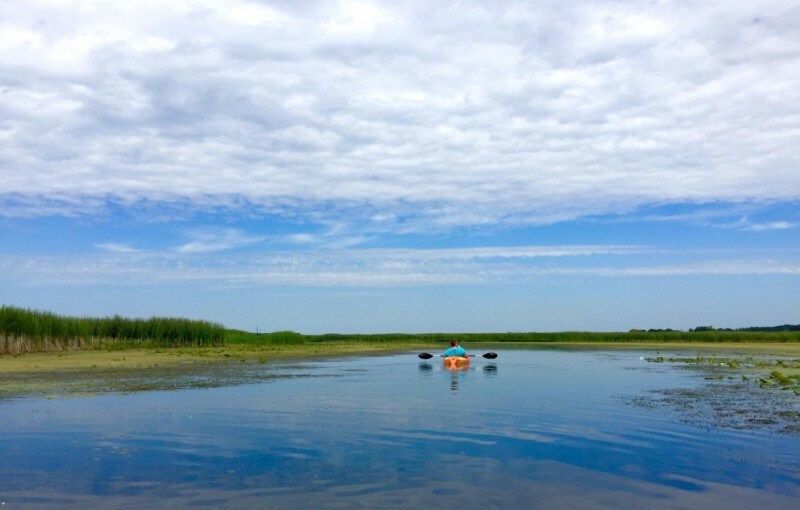 Watersheds operate as independent systems—they don’t adhere to state boundaries or county lines, yet a given watershed experiences environmental issues, like water quality and pollution, as a whole, interconnected system. Though they were unaware at the time, the stretch of the lower Grand River they navigated in Ottawa County is actually an established water trail called the Grand River Heritage Water Trail. A water trail is a designated route on a waterway with a network of public access points and signage. Similar to a hiking trail, water trails help encourage recreation and conservation by directly connecting people with the water system. The Grand River Heritage Water Trail was implemented and is maintained by the Ottawa County Parks and Recreation Commission. Ottawa County Parks has invested in facilities, bathrooms, signage, and other infrastructure, like more boat launches and accessibility points, all along the river. In addition to boosting tourism and promoting physical fitness, water trails help intimately connect people with their local bodies of water, bringing to light both the beauties and the problems present in their water. Ottawa County has already installed 18 access points, three of which are handicap accessible. They’ve also highlighted 60 historical features along the river, which water trail users can learn about through signage along the river and online maps. Even with substantial water trail development so far, according to LePage and Cahill, some additional features could still make paddling the river a more enjoyable experience. “I wish that there were better camping spots. It would be a great two day trip if there was a space to stop for the night, make a fire, play Frisbee,” said LePage. 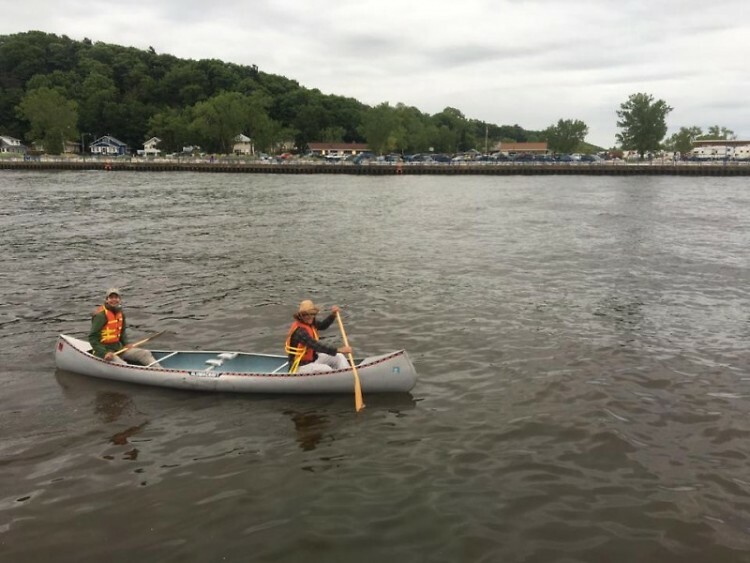 Since there are few obvious places to stop for the night, Lepage and Cahill—if they wanted to paddle the whole stretch—had to do it in one day. “My arms were really sore the next day,” said Cahill. Input and ideas for improvement like this is exactly what Elaine Isely, the Director of Water and LID Programs with the West Michigan Environmental Action Council (WMEAC), is looking for. Along with representatives from GVSU's Hospitality and Tourism Management Department, Ottawa County Parks, the Lower Grand River Organization of Watersheds (LGROW), and the Grand Haven Area Convention and Visitor Bureau, Isely is working to evaluate the current infrastructure, marketing, and management of the existing Grand River Heritage Trail that runs the length of the Grand in Ottawa County. “As part of that process, we are reaching out to paddlers, outfitters, and the communities along the river corridor - specifically community leaders and safety officers. Our plan is to take what we learn in Ottawa County upstream to the communities along the river in Kent, and then Ionia County,” said Isely. WMEAC has hosted several meetings, the final of which will be September 13, 2016 at 3:00 p.m. at Ottawa County Parks Grand Ravines North facility in Jenison. Although connecting people with the watershed is an important goal from an environmental standpoint, it can also cause new problems to surface. For example, if the river sees an influx of people paddling the water, new measures will need to be taken to respond to a possible increase in water-related emergencies. On LePage and Cahill’s voyage, the two felt safe a majority of the time. Even though it was a windy day, waves were minimal and the river was relatively untraveled. 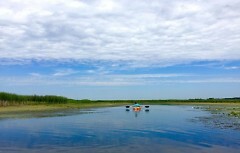 “We canoed the whole way against a headwind. The trees really helped block the wind. Having forest on the edge really helped us canoe down the river,” LePage said. But when the two reached Grand Haven, their voyage was cut short. In order to reach the Big Lake itself, they would have needed to navigate the canoe through large swells rolling in off Lake Michigan. Taking safety into account, they pulled off in a nearby harbor. “In addition to [evaluating the Grand River Heritage Trail], the State of Michigan is interested in establishing a water trail for the entire length of the Grand River, from Jackson to Grand Haven,” Isely said. In developing a water trail along the length of the river—all 252-miles of it—the state would need to coordinate efforts across seven counties and hundreds of townships. The route would follow that of the Grand River Expedition, a week-long paddle trip completed once every decade by dedicated citizens, naturalists, anglers, environmentalists and others concerned with the health of the river, or just curious about what it has to offer. The next trip is scheduled for the summer of 2020, by which time the MDNR hopes to have made some significant advancements in their work toward a connected Grand River water trail. “We’re a little behind the ball right now, but we’re pushing hard to keep the project moving,” McGhee said.